background was made with some brushes and tools and I put this texture on the windows. hum... I dont know if the rain was good but I trying do my best ^^"
Well... this wallie isnt special, just a simple and ranny wallie for one of lolitas from Rozen Maiden! Anyway... this wallie is for all who likes Rozen Maiden dolls and suport me everytime!! Hello Idril, How are you doing? this wall looks very nice, i love the tress in the bg and you made the cage very nice. One of the more "Interesting" wallpapers i've seen by Idril-chwan. The "Cage" looks like windows to me, though. So I was thinking, "Alice and Through the Looking Glass" type thing. Yo Idril, how's it goin'?? Ahh, i see this is your latest wallies, eh? Well, i have to say, this is extreamly beautyfull, I'm lovin' the bg, it matches very well w/ the scan, i also like the whole "window effect" ya got goin on!! Gosh, everything has such a pretty detai that i'm speachless!!!! Heh, heh... Well, i can say something...^ ^ please, keep up the awesome work dude, 'cause it rocks!!!!!! oooooooo it is so pretty. nice rainy background. Everything matches great together. Its very beautiful and i really really like it a lot!!!!!!!!!! Awesome Job!!! wow! that looks verry good, i like the window idea and the rain with the textures....they fit so well and the clouds ouside of the glass..i like the idea of it and it really matches with the scan......great job! Interesting way of giving the impression of a rainy view from the window - spiffy (very cool)! you never stop to amaze me with your wallies Idril!!! I will add it to my fav as soon as my favs are restorted!!! 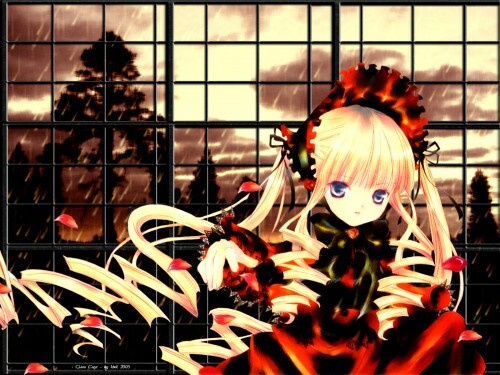 I love Rozen Maiden stuff~ Thankyou very much~~ Once again you've made a very lovely wp. Keep it up!